If you’ve been around here a while, you know I attend a good many conventions over the year. Anime, Sci-Fi, Board Games, Web Development; my interests and job skills span a lot of categories. Recently however I had a new one to add: Tattoo Convention. The Motor City Tattoo Expo is an annual gathering of some of the best tattoo artists around the world. It’s been going since 1996, and what really interested me was that it’s curated by the organizers. Artists are invited, rather than just an open market free-for-all. I’ve wanted a tattoo since I was about 14. My mom is a practical person and her only response to this interest was “Not until you’re 18.” Meaning, she wasn’t about to sign for me (if that’s even a thing…) and I better not show up with some sketchy ink from who-knows-where. I made it to 18, and luckily wasn’t certain what I wanted. I’ve entertained a few different designs over the years, and I liked them all in their time, but none called to me distinctly in a “I want this FOREVER” way. Which is a pretty important criteria for me. I would get temporary tattoos and apply the same design for a month and see how I felt. Goofy I know, but I still think it kept me from getting something I’d be less excited to have now. I understood permanence to an extent, as much as anyone can fathom it, and knew I better be damned sure of what I wanted. When I was younger, I would get temporary tattoos and apply the same design for a month and see how I felt. Trying various locations to figure out where would be appealing to me. By this point I’d established: nothing on the face, nothing on my chest, no “tramp stamps”, and considering my health problems, nothing on my legs. Maybe my shoulder? Shoulder-blades/back/neck region? Inside wrist? On top of that, the WHO was always a big question. The artist is more important than the art in many ways and I wanted to be sure of who was in charge of the needles when the time came. Friends and people I would interact with (hair stylist, make up artist) who had amazing work would get asked if they’d share their artist. Who did they trust? Who would they go back to? I got a few names over the years, but still didn’t have a solid pick for what I wanted and didn’t want to waste anyone’s time. The internet was a great boon as a resource – I made sure to research everything. What were the signs of a properly functioning tattoo shop? Health and hygiene requirements to watch for. What to look for in a portfolio. (If they didn’t have one, walk out.) An empty tattoo shop (one a little too devoid of customers) isn’t a good sign. Inkers are artists and in the service industry at the same time. Prepare to pay well and tip well. Like much in life, you get what you pay for and a discount tattoo is about the scariest thing to want…. At least once a year, for a while, my mom would tease that 18 had come and gone and I still didn’t have anything. More of a “mother knows best” chuckle. My younger siblings had both gotten tattoos. I wasn’t bothered. It would come together when the time was right. I met the guy who would become my husband. Ours was an instant connection. After 10 years of awesomeness we decided to get married – at the Renaissance Festival. I suddenly knew the perfect option to have for my first tattoo. After 6 years, I hadn’t changed my mind. So it was that I turned to my husband and said “There’s a tattoo expo downtown. Let’s go check it out!” and he sweetly said, without hesitation, “SURE!”. I hoped that I could at least find someone whose style matched my little sketch and who I connected with enough to work with at a later date. Perusing portfolios I did find a couple of people who I liked – but it was when I stopped at a table that had caught my attention with its “tattooed” wooden artist’s hand and a business card that said FUCKS with a red line through it (no fucks) that my fate was sealed. It belonged to SassMouth Ink and Tracey was behind the table and chatted me up. 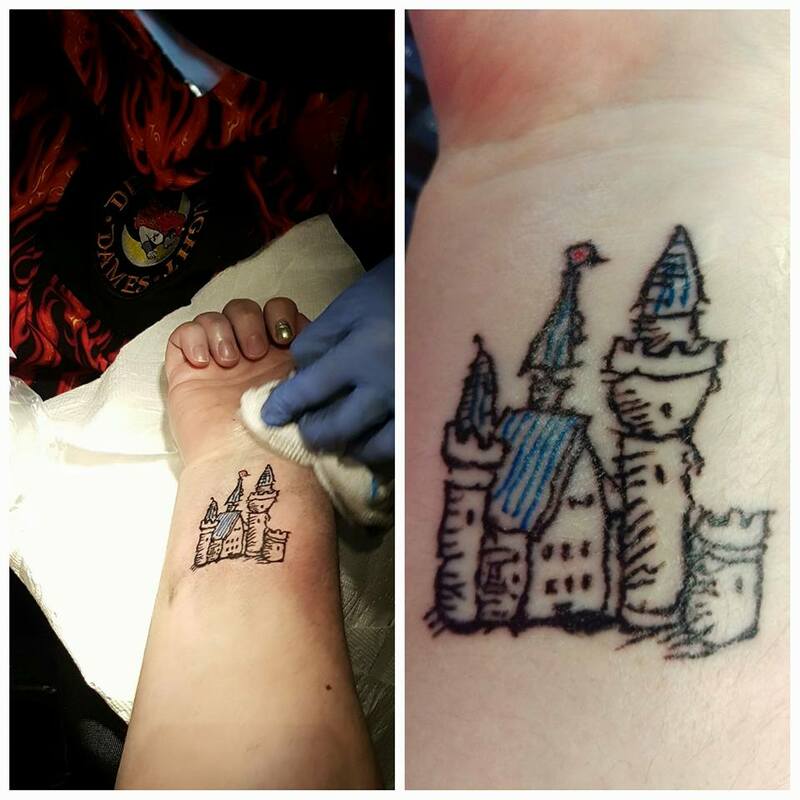 She asked something along the lines of if I had something in mind for a tattoo, and I showed her the little castle on my phone. She explained the artist was booked for the day – but was pretty certain she could be persuaded to do another. Especially a small, adorable, and meaning-filled one such as mine. She asked me to swing around in 15 minutes. I did – we were a go. I said I could have brought out the big guns if needed; and showed off the wedding photo of myself and Chris in ren-garb with a rainbow umbrella shining behind my purple hair. Tracey agreed, that would have been a clincher. Cee Jay (I didn’t even get to tell her the irony of her having the “same” name as the person who introduced us) sketched a copy and got to work. We had a minor false start (always communicate with the artist!) but got it sorted out. I chose the inside of my right wrist for a few reasons: I wanted to enjoy seeing it daily. Also, I’m left-handed. It’ll probably get less stress being on my non-dominant hand plus easier to stare at while I’m writing or whatnot. Cee Jay (surprised? impressed? something…) commented on me being very chill for my first tattoo. The wrist isn’t the worst place to pick (unless you’re very thin or going over bony spots) but still, I was surprised it really didn’t hurt a lot. Now, it’s not to say I didn’t feel ANYTHING. There were some long lines that made me clench my jaw. Honestly though, and I have a low pain threshold trust me, it wasn’t any worse than the pinch of a shot/giving blood. I’ve had nurses dig for a vein and cause more pain than this. Watching her work the machine was pretty interesting too. It was quite tender the next day. A day of aching was more annoying than the 1.5 hours of being repeatedly needle-stabbed. I still say worth it! I have an adorable keepsake to carry with me that reminds me of Chris, our wedding, our adventures…. Tattoos don’t have to be deep spiritual things for everyone, but for me I knew I wanted it to represent something special whenever I saw it.